Our two home games this year, against Sunderland and Arsenal, have been notable for attracting large numbers of away fans to the town. Those away supporters have massively outnumbered Blackpool’s home fans – only to be expected in the circumstances – and have apparently created a rare sense of atmosphere not experienced inside Bloomfield Road for several seasons. To their credit, those away fans were extremely sympathetic towards the plight of Blackpool’s ethical boycott. Sunderland fans have, in the recent past, experienced significant problems with the owners of their club and many Arsenal supporters suspect their own battle is looming with Mr Kroenke. Large numbers of both sets of visiting supporters stopped by BST’s ‘outdoor office’ opposite the West Stand to talk about the ongoing campaign against our majority owner, to understand in some cases why fans have been staying away, to express both shock and admiration that this principled stand against the man who has illegitimately stripped our club and taken legal action against fans has been going on for four years and more, to voice their solidarity as fellow football fans both inside and outside the ground and to buy Oyston Out scarves (which sold out on each occasion). We would all have liked to enjoy games like those against Sunderland and Arsenal, but for the thousands boycotting, our stand is a principled one. It is continuing to hold firm and will do so until the Oystons no longer have any power, influence or financial interest in Blackpool FC. Both games also attracted considerable media interest, the Arsenal match in particular, which gave the larger than usual number of boycotting Blackpool fans outside Bloomfield Road an excellent platform to explain the unacceptable situation at Blackpool FC to national and international press and TV. The profile of the ongoing campaign for regime change at our club has possibly never been higher, so thank you to all who have played their part and made sacrifices in the interests of eventually securing a brighter future for Blackpool FC. The pressure continues to mount. The next court date in the litigation between Valeri Belokon and the Oystons has been announced for the second week of February (exact day and time between 11th and 13th still to be scheduled). It is to be hoped that Oxit (or Owen-Exit as Mr Belokon calls it) will finally move ahead, more purposefully and speedily than Brexit. Next Tuesday will mark the first anniversary of Jimmy Armfield’s death. One of the first things BST would like to do, once there is ownership change at Bloomfield Road, is help to organise a fitting footballing memorial for Jimmy, subject to his family’s approval. It is surely the sort of occasion that would help reunite the fanbase in celebration of what it means to be a Seasider. In the meantime, the Trust is proposing that the league game at nearby Accrington Stanley on February 2 is a great occasion for Pool fans to turn out in force, for a number of reasons. The first is to lend concrete support to a football club that is doing so many things in the right way. Some of you may have caught BBC TV’s short profile of Stanley this week. The ‘small club with the big heart’ currently occupies the highest position it has ever achieved in the Football League. John Coleman is about to clock up his 1,000th match as manager and, in chairman Andy Holt, the club has an owner who is the happy antithesis of Oyston. Stanley is a club where everyone makes themselves accessible, from the chairman and manager right through the playing squad and all regularly socialise with the fans after the game. The second reason to attend is that Accrington Stanley has recognised the plight of Blackpool fans. Stanley is making the majority of its allocation to away fans directly purchasable from Accrington, either in advance or on the gate. The official Accrington Stanley Supporters Club is also producing a commemorative ‘The Fans Own Football’ pin badge for the game and is donating all profits from its sale to Blackpool Supporters’ Trust. 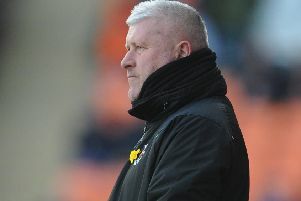 So let’s sell out the away end at Accrington, enjoy a great day out at a great football club and at the same time demonstrate to Terry McPhillips, the Blackpool team and any prospective buyers of Blackpool FC that the Seaside support and spirit really is there, waiting on the day when we can all return to an Oyston-free Bloomfield Road.